Golden Apples: Like a note sealed in a bottle, and cast into the deep blue sea. Like a note sealed in a bottle, and cast into the deep blue sea. --that's how I feel about this blog sometimes! I know I have readership—I know others link to me, and read my blog. Most often, I write for me, not for my readers. I am startled –(and pleased!) to find I have readers, to read their comments, to learn that something I have written moves them. 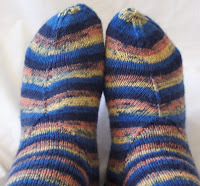 I was gleeful when I found (as I did)links to my patterns posted on Ravelry (before I was member there). I think, years (thousands of years!) from now, the turn of the millennium will be one of those pivotal dates. There will be the iron age, the dark ages, the age of enlightenment, the industrial age, and the –I am guessing—the information age. How different the world is today than it was, not just in my youth, but for the past 500 years. Long ago, Gutenberg changed the world by providing books, at first, to the wealthy(and eventally to all) --and with Martin Luther-- by advocated that each person should read scripture for themselves—together, these men changed the world in ways I think would surprise them! Today, unlike in their day, the world has become generally literate—and is rapidly moving from being a world of receivers of information, to a world of creators. Many countries have 90% or greater literacy, but even the poor countries of the world have a greater level of literacy then was common anywhere 500 years ago. Then, perhaps many knew texts by rote, and could recite them, but few could read—today that is far less true, for many more people. This onslaught of information can be daunting, but it is also liberating. I grew up in a age of proper, authoritarian rules for behaviors--he was only one right way to do many things. But now days, I know many 'right ways'--some I accept, some I reject, but my world is larger. Knitting today reflect these wider views of the world. Some traditions knit top (cuff) down socks, others knit toe up sock. Some traditions feature solid colors, and fancy stitch work, others, simple stitches, with color work. There are different cast on's, different heels, different details. I am heir to all of them. I'm here! And I'm reading. And thinking. Yes, you knit beautiful projects, but what is really cool is that you give folks a lot to think about. What a concept! OfTroy, I may not comment, but I really do appreciate. And Errs, I feel for you. My dh has a 13 foot too, unfortunately. It's great to know that there is someone else who is interested in picking up lots of ideas and using them in personalised projects, rather than just knitting the same pattern as a thousand others. Browsing round other people's work often leads to a "what if" moment for me, and I love to see things that are a bit different - please keep on making them and showing them to us. I am enjoying your Blog, very much. Thank you for your help with knitting projects...you are a natural teacher and i am learning much from you.... I am way up here in Alaska with the moose, eagles, and mosquetos; perpetual sunlight in summer; and perpetual darkness in winter. In summer i put a block of ice in a broiling pan (shallow & large) sit the pan in front of my fan and i sit facing the fan & ice. Cool moist air on hot dry day..feels wonderful! This is where i knit on hot day.